A main element of the Systems Team at Willow’s job is to maintain gear in our venues and train users when needed. Since we operate as Engineers on Call (EOC) during services and events, much of our feedback on how users interact with our systems comes in the form of helpdesk tickets or calls to our tech hotline – lovingly known as the CRAP line (x2727 spells CRAP for “oh crap!” technical moments…or ASAP – as in, “We’ll be there right away!”). On a given event day, we could get a ticket or call from a basic quick fix, to learning that our LED screens failed. A good portion of our calls come from well-meaning users who aren’t aware of the technical abilities and limitations of the space they are in. This got us thinking…How can we help set proper expectations for those using our venues through pre-communication? As most techies do, we set down to start doing research, asking who, what, when, where, why, how? Who: Who are the users in these spaces and what are their skill levels? Our classroom spaces are multi-purpose and are used for classes, weekend children’s programs with full audio/video/lighting setups, and meetings. The technical skill for the operators of these events is vast – from first-time users turning up a fader to on-staff Technical Directors. This means our information needs to speak to both technical newbie and longtime tech wizards without being overwhelming. What: What are we getting tickets or calls on the most? Most of the calls are due to knowledge gap more than system failure. On a basic level, someone doesn’t know how to turn on the lighting console, plug their computer in, or why the mic is squealing. The next level of user questions involves more detail – why can’t I watch the service in this room? My computer doesn’t have VGA – what do I do? Can I video record this event? When: When are people asking questions? Can we interject information sooner? For newer users, they are calling us within 10-30 minutes of their program’s start and urgency level is high. If someone is a frequent user of the room and does proper pre-event checks, we’ll get calls as soon as they notice something is out of whack – usually 30-60 minutes prior to their event’s starting time. We do our best to interject room capability information as we learn of what the event will entail, but communication isn’t always ideal. Where: Where can we post this information so it is easily accessible? The further we got into this project, the more it became clear that the information needed to be accessible to Willow Staff, department operations directors, and those who schedule rooms, events, and technical support. We were met with enthusiastic support by our communications department who quickly posted the document to our staff website and the operations directors the document was directly emailed to. Why: Can we cast vision so users and schedulers understand why this is important? As we all know, a system is only as effective as those who choose to use it. 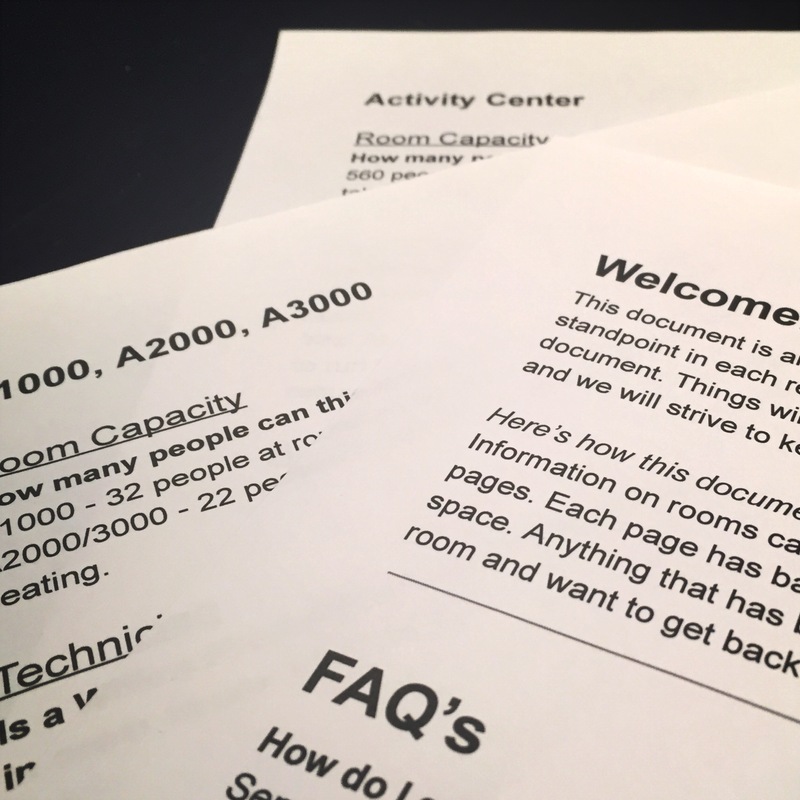 One of our systems team members took time to talk with a few ministry event operations directors to gauge interest in a document that shows what rooms can and can’t do. The response was surprisingly positive! Once we were able to get the document posted, the document filled an information gap that had been open for quite some time. How: How will this information be maintained and updated? After some discussions, we decided the document could be most easily maintained if we posted it on Google Docs. This enables our team to update information as our systems evolve with the ever-changing technology industry. How many people can this room hold? Is a Willow Production technician required in order to use this room? Is there an audio system installed in the room? How do I play music from a computer? Can my class be recorded? Can this room support live music? How can I show a presentation? Is there a computer I can use in the room for a presentation? Can I watch TV/Willow’s internal channels here? Can I show a DVD or BluRay? Can I dim the lights during an event? Are there stage lights available? We plugged each room into this basic questionnaire and came up with what is known as our Production Room Capabilities sheet. As an added bonus, we added options to search by room name or size and inserted hyperlinks throughout the sheet to make the document interactive. How do you help those you serve to understand what your spaces can do?